Pro Tour weekends always excite me both as a player and finance writer. It is a weekend of breakout card(s) and wild price spikes. It is a weekend showcasing the pinnacle of Magic innovation as pros around the world attempt to break cards from the new set. And the stakes are high: find the best deck in the format and they stand a chance to win a substantial amount of cash and eternal glory in the Magic community. The interesting cards had always been those that were initially brushed off as unplayable and it’s always a joy to watch the Pro Tour competitors prove otherwise. Those were the cards that gave me those sweet moment of realization when I saw the pros do broken things with it. Those were the cards that spiked the hardest. Those were the cards that I beat myself up for not divining their potential during my initial evaluation, but then again hindsight is always Marit Lage. In retrospect, every investor would have bought Apple shares in the early 2000s. I will be adopting a slightly different approach to today’s pre-Pro Tour article. I will still be discussing cards I am betting on for the Pro Tour as I’ve did for the previous ones. Today I will also discuss the misconceptions that plagued early card evaluation. In the last few years since I’ve got in touch with my Spikey side, I’ve had the opportunity to witness plenty of misevaluated cards shoot up in price as they revealed their true color in the hands of innovative brewers. I picked up a few pointers after years of berating myself for missing out on those treasure cruises. Boros Reckoner was $5 when Gatecrash was released. He was the breakout card in Pro Tour Gatecrash, where he was the most ubiquitous card in the top 8, seeing play in multiple archetypes in multiple copies. He shot up to the high $20s briefly and remained at $12 for most of his Standard life (with a spurt to the $20s again when Theros rotated in, probably attributed to the Red Devotion archetype). Boros Reckoner was obviously a force to be reckoned with, but why was he shunned during his first few weeks of entering the metagame? 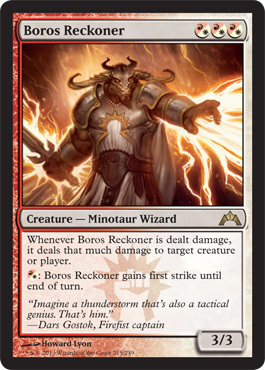 Boros Reckoner has a spot in the Minotaur Hall of Fame for being the only playable minotaur in modern Magic. Three white/red pips gave the impression that Boros Reckoner was difficult to cast on curve. The assumption turned out to be wrong, as the first home Boros Reckoner found was in an impressive Gruul list brewed by Tomoharu Saito. The fact that an RG deck did not had issues resolving a Boros Reckoner on curve proved that the minotaur wizard was easier to cast than initially assumed. Boros Reckoner ended up seeing play in Jeskai and Mardu decks at Pro Tour Gatecrash, including Tom Martell’s winning list, The Aristocrats. It seemed that with a mixture of shocklands and enemy-colored checklands, fogging up three red/white mana on turn three was never an issue. Master of Waves dies to board wipe. Siege Rhino gets stalled by Polukranos, World Eater. Both spiked hard after the Pro Tour that followed their respective sets. Both ended up as Standard staples. He moonlighted as Master of Wallets in late 2013. How did so many players and financiers, myself included, overlooked their prowess? Here’s where the usefulness of theorycrafting ends, and the importance of playtesting steps in. A portion of the Pro Tour Theros players steered away from Mono-Blue Devotion, concerned that Master of Waves kolds to Supreme Verdict. The power level of the synergy in Mono-Blue Devotion was not apparent even to the then Team StarCityGames until Kai Budde and Gabriel Nassif began testing the deck on the side while the rest were testing legit decks. Mono-Blue Devotion allegedly put up such an incredible win percentage that it convinced nearly the whole Team StarCityGames to switch to it (I can’t seem to find the source for this anecdote. I was sure I read it in someone’s Pro Tour report. Do enlighten me in the comments if you recall whose article it was). The emergence of Mono-Blue marked another milestone in R & D’s shift towards a more board-centric gameplay, which could be another reason Master of Waves, a cornerstone of a synergy deck, were initially discounted as competitively irrelevant. The theory that synergy decks lacks resilience against board wipes were challenged. No matter how powerful a card is, it will always kold to another card. R & D have been doing a pretty good job at keeping powerful cards in check with safety valves over the past few years. A card without a weak spot would probably end up on the banlist. The oppressive Sphinx’s Revelation was hovering at merely $5 a month after its release. Sphinx’s Revelation drew comparison to an older card which saw little-to-no play during its time in Standard. 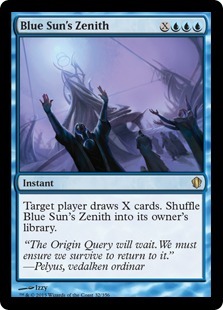 In retrospect, comparing Sphinx’s Revelation to Blue Sun’s Zenith was completely wrong, but at a glance, both cards seemed to serve the same purpose of being a control finisher. Plus life gain used to be ascribed as durdly and was considered to be inappropriate for the high society of competitive Magic. 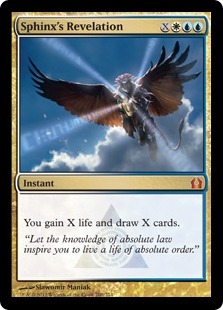 Sphinx’s Revelation’s tacked on life gain was the sole factor that pushed the card from a just ran to a four-of staple in blue-based control decks. Drawing seven cards, even if your drew into your Supreme Verdict to reset the board, would be irrelevant if you were dead to a Lightning Bolt the next turn. But draw seven cards and buy yourself an extra turn? That is a world of difference. Now you can sweep the board and have enough life to survive a burn spell to untap and unleash your grip on the board with your clutch of spells. Sphinx’s Revelation did not spike following a breakout performance in a Pro Tour, but that could be ascribed to the fact that Pro Tour Return to Ravnica was Modern and was taken down by Second Breakfast. The price of Sphinx’s Revelation started ascending a few weeks after the Pro Tour when Bant Control started to abuse Sphinx’s Revelation in tandem with Thragtusk and rarely went below $20 throughout most of its life in Standard. A card that works best only when casted off the top of your library and only if it’s the first card you draw that turn? It’s a little too conditional to be a four-off in your 75. It’s hard to judge the merits of a card with novel, never-before-seen mechanics like Miracles without playtesting with it. Now that we’ve went through the pitfalls of card evaluation, here are my picks for the breakout cards for Pro Tour Dragons of Tarkir. 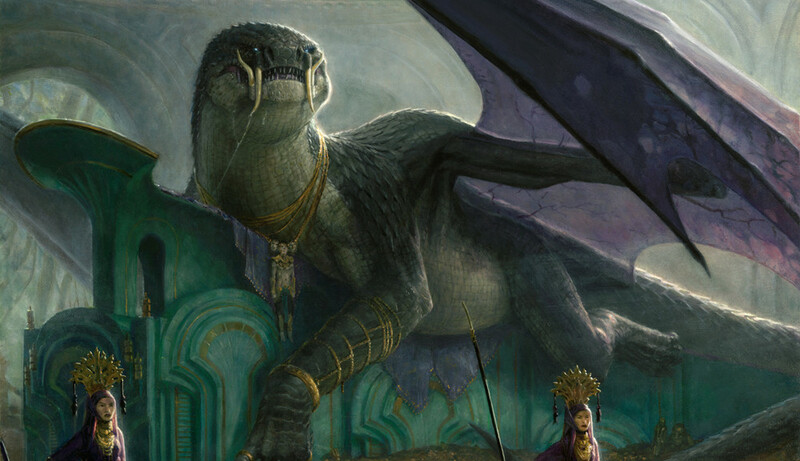 Tarkir dragons’ birdliness was never more apparent than in Ojutai and his brood. Dragonlord Ojutai has spiked. At $18, Dragonlord Ojutai is the most expensive Dragonlord, double the price of the second most pricey, Dragonlord Atarka (I guess I was wrong on Atarka). If you’ve bought into Dragonlord Ojutai at $6 after reading my article a few weeks back, now is the time to sell if you are not keeping them for yourself. 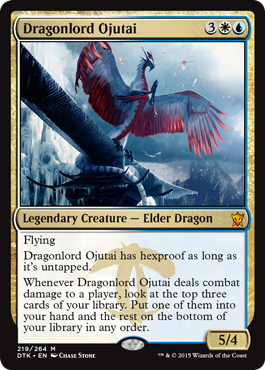 Dragonlord Ojutai is one of my horses (or dragons) for the breakout card of the Pro Tour, but at $18 he is already flying close to his ceiling. Don’t get Icarused. Dragonlord Ojutai is one of those cards that seemed too conditional on paper, but performs better than expected in playtesting. Draw me like one of your French EDH commanders. I am surprised that Dragonlord Silumgar has not been seeing a much action besides Shaheen Soorani’s sideboard and as a one of in Reid Duke’s Sultai Reanimator which was runner-up in the recent StarCityGames Invitational, and Andrew Ziggas’ Sultai Reanimator, which was coincidentally also runner-up in a TCGPlayer 5K. Perhaps the pros were merely sandbagging their super secret Dragonlord Silumgar tech for the Pro Tour. I’ve had the opportunity to run Dragonlord Silumgar last weekend at a PPTQ and he was by far the card I was most impressed with in my deck. Dragonlord Silumgar was in my sideboard as a two of and I’ve brought him in for every single post-board game as per Shaheen’s recommendation. Reid Duke was spot on when he mentioned that Dragonlord Silumgar ‘knocks it out of the park’ if left unanswered. Not only did Dragonlord Silumgar single-handedly took down games if left unanswered, he was a card I was happy to see when I was winning or losing. When I was ahead, Dragonlord Silumgar helped close games and transformed my Silumgar’s Scorn into Counterspell to tighten my vice-like grip on the game. When I was behind, Dragonlord Silumgar generated instant board presence. The Dragonlord held the skies pretty well too, with a five toughness and Deathtouch. I suspect Dragonlord Silumgar is currently not seeing the play he deserves due to the perception that he dies to too many cards. Like Master of Waves. From what little experience I’ve had with him, Dragonlord Silumgar was surprisingly resilient with his five toughness. If your opponent was not running Hero’s Downfall or Murderous Cut, he or she would most likely require two cards to take out Dragonlord Silumgar, putting you ahead in parity. Like Master of Waves, Dragonlord Silumgar spells game over for your opponent if he or she does not come up with an answer fast enough. At $7, it may be prudent to acquire your playset right now in the not insignificant probability that Dragonlord Silumgar actually turns out to be a super secret tech at Pro Tour Dragons of Tarkir. I have a feeling that one copy in the sideboard is way too little for a card as game-breaking as Dragonlord Silumgar. $7 is also not a bad buy-in price if you are interested to speculate on Dragonlord Silumgar. My last dragon in the race is Dragonlord Kolaghan. I know, I was extremely disparaging in my review of this Dragonlord. 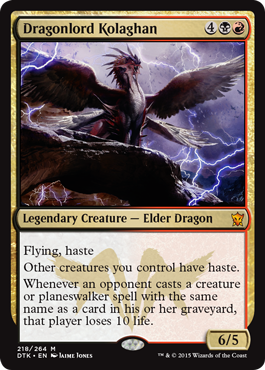 I was disappointed that Wizards spent one valuable Elder Dragon slot on an Elder Dragon that is nigh unplayable as a Commander. I also thought she was too clunky for Standard play. Gerard Fabiano’s paragraph on Dragonlord Kolaghan changed my perception on her. Gerard Fabiano made good points that Dragonlord Kolaghan is a ” win condition that can sometimes lock your opponent out of racing back” and the fact that you can ramp out a turn five Dragonlord Kolaghan in Jund builds. However, he relegated Dragonlord Kolaghan to the sideboard at the StarCityGames Syracuse Open. $5.50 is pricey for a mythic whose chance of breaking out at the Pro Tour is hard to predict. Dragonlord Kolaghan is the cheapest of the Dragonlords though and my recommendation would be to hold her and see if she breaks out at the Pro Tour. And maybe trade into your playset if you have the chance to do so before the Pro Tour. I kind of regret trading off the Dragonlord Kolaghan I opened in one of my prerelease packs for components to update my Standard deck for Dragons of Tarkir. I’ll be personally looking to assemble my own playset of Dragonlord Kolaghan prior to the Pro Tour. So the die was cast. My hat is now in the proverbial ring. Those three dragons are my bets for the breakout cards of the weekend. I did not mention Thunderbreak Regent as Thunderbreak has already broke out, or shall I say stormed out, during last week’s StarCityGames Syracuse Open as one of the most played card in the top 8. Have a good week ahead and happy Pro Tour weekend! I’m a bit surprised about your call on Kolaghan. It would indeed be a great spec if it actually turned out to be as good as Gerard say it is. But it just seems to conditional and narrow to rely on. Not every deck has a full set of every relevant card. I guess it will be very meta dependent in that case. But with the current low price I don’t see the harm in acquiring a playset though. Yeah, I agree that Kolaghan’s second clause may be too conditional. As Gerard mentioned, it would only lock out your opponent occasionally. The part of his review that caught my interest was the fact that Kolaghan is a solid clock that could be ramped out early in an aggressive build. Kolaghan is no Thundermaw Hellkite, but she is still a 6-power hasty beater in the sky. And she stands up to Thunderbreak Regent. Or even with… we’ll see in a few days. Yup, I am with you on that fact that there is no harm in acquiring a playset of Dragonlord Kolaghan. I don’t think she can drop much more than her current $5.50 (being a mythic in a set that is not going to be opened much and being an Elder Dragon). good stuff in the section about ways cards get misevaluated before a pt. it woulda been cool to include a few examples from this set that you think might match up to those mistakes. Also, ping you editor. This needs another read through. But again, great stuff. Love your work. Thanks David! The three dragons I am betting on were supposed to be the examples from this set, especially Dragonlord Silumgar. 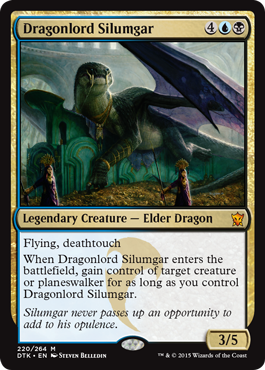 I suspect brewers were steering away from Dragonlord Silumgar because he ‘dies to X and X’. Sorry for the grammatical errors, I’ll get them fixed during lunch break in a bit. Thanks for reading! Ah gotcha. Yeah the “dies to x” examples are exactly what I’m talking about. Everyone says Ojutai is the breakout dragon, but he hasn’t ‘broken out’ of anywhere, really… we have seen him in some Jeskai sideboards, but Atarka has been much more prevalent in winning maindecks. Are people just hoping Ojutai will be a hot commodity at the PT, or are they just relying on a few pros’ assumptions, without any actual results? Thanks! The results from the first two weeks of a new set, prior to the set’s Pro Tour, may not accurately reflect the true power level of cards, especially one that is less obvious like Ojutai. Two weeks is not enough to explore the possibilities a new set has to offer. Plus most pros would be keeping mum about whatever new tech they have up their sleeves for the Pro Tour. Yup, I think many, myself included, are expecting Ojutai to see more action at the Pro Tour. Plus Dragonlord Ojutai is currently the second most expensive DTK card on Magic Online at 17.49 tix. Card prices on Magic Online sometimes give a clue on what cards are being tested for the Pro Tour. 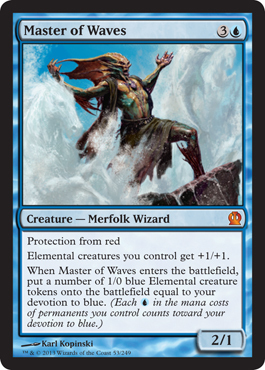 Master of Waves started spiking on Magic Online a few days before Pro Tour Theros. Great article again bud. I like the positive look at things instead of just what isn’t a good thing to do in the world of magic (finance). I feel like CVM’s win at the SCG open was a bit of a fluke and I think the pros are going to be jamming control and lots of blue cards at the pro tour like usual. The best answer to a caryatid + courser deck is counter the thing they are building up to…or thoughtseize it. I personally hope Mardu makes a comeback. I’m not sure how much better crackling doom can get right now. 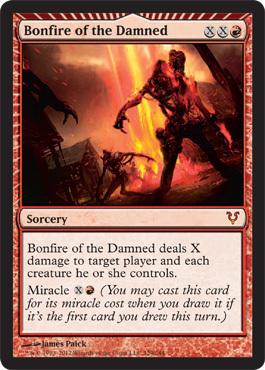 When Mardu was popular I had to rotate away from GR Monsters during Khans release simply because of crackling doom; and that was before murderous cut, ultimate price, roast, and valorous stance. I’m deciding between playing Mardu at States but my friends want me to keep playing my Red Green deck cause I’ve done extremely well with it over the last several months…but when Rabblemaster and Polukronos are bad I don’t think I can play my pet deck. The other end of the spectrum are the hyper aggro decks. The kid playing RB aggro at the scg open may have accidentally stumbled on something. I played against a version on mtgo and my opponent played a great deck punctuated by self-inflicted wound (sac green or white creature). So my mystic got wild slashed and my caryatid got sac’d and i lost 2 life in the process…on the draw this was miserable. Oh and after foddering and hordeling outbursting his murderous cuts were greatly discounted and he gladly took 3 damage to kill my Thunderbreaks and get in for a ton of damage. Talking about the pro tour, I hope and think Mardu and Crackling Doom with Sorin and Elspeth (and new Sidisi) will make a re-emergence. Doom takes care of Thunderbreak without taking damage and kills Ojutai and Hexproof Silumgar not to mention it just destroys heroic unless they run stubborn denial and I feel like heroic has moved away from that card (I think I’ve talked myself into playing it now for States). Ojutai is a problem to be reckoned with, and I had agreed with you in last week’s article…I just did not see $15 coming though and wish I jumped on the $5 gravy train. Dragonlord Silumgar seems like the most fun casual dragon to cast or FNM hero. Kolaghan still just seems like a 1 or 2 of as a curve topper. He dodges most of the cheap removal but he doesn’t say “you die if you don’t kill me” or “I’m about to create so much card advantage” like Dragonlords Silumgar and Ojutai. He also doesn’t even trade with Hexproof Silumgar and he straight dies to Atarka’s ETB trigger so I’m sorry, I still don’t like Kolaghan that much and think Wizards design really missed the boat badly with him. Thanks again for the great article, I look forward to a fun and exciting weekend. As long as something other than Siege Rhino wins I’ll be happy…but I likely just jinxed myself lol. If Abzan puts 3 or 4 Ultimate Price in the side I could see it winning…2 mana to kill Stormbreath which is the worst card for Abzan, seems good! Yeah, I agree with you that last week’s SCG results seemed a tad bit peculiar (though I think CVM rightly deserved it after reading his article yesterday on how he came to the deck and next leveled the field). I thought it was a bit suspect that all eight decks in the top 8 were aggro lists! Either we are in the golden age of aggro or the pros were sandbagging their sweet, refined midrange and blue-based lists, which as you’ve mentioned, are the pros usual go-to for the Pro Tour. You have a good point on Crackling Doom. I totally forgot that Crackling Doom is a very efficient way to take out Ojutai. Yeah, Mardu may be the dark horse in the Pro Tour. Come to think of it, Kolaghan may be a decent finisher for Mardu! Yes, she does not gives you as much value as her fellow Dragonlords, but I do imagine it would be easier to trigger her ten to the face clause in a Mardu deck with so much removal. hahaha, good point about the Rhino among the Dragons. “Rhinos of Tarkir” def does NOT have the same ring to it. And I have an issue with the title “aggro deck”…a deck with caryatid, courser, and 2 7 drops is NOT an aggro deck. CVM played a midrange deck, it’s RG monsters 🙂 I had the same argument with my friends playing Abzan Aggro; having 4 5 drops (Wingmate Roc) and 24-25 land does not make a deck an aggro deck in the least. Enjoy the coverage!